The charge took 1:48 hours and gave the vehicle a range of 504 kilometers (313 miles) with a reported cost of $18.98 for a full charge. Ever wondered how a full Tesla Model 3 charge looks like? The video above gives us a direct answer to that question in form of a rather nifty time-lapse video. It represents a Tesla Model 3 Long Range, being supercharged completely from 0 – 100% charge. The video showcases a full session time lapse, the vehicle’s battery is warm and the owner didn’t have to share the Tesla Supercharger with anyone else. The complete charge took 1:48h and gave the vehicle a range of 504 kilometers (313 miles). Additionally, it juiced up the battery with 75kWh with a max charge rate of a whopping 117 kW. The Model 3 Long Range comes with a 75 kWh battery pack. This means that when the vehicle is connected to a Supercharger and charging at a rate of 115 kW, it will reach a 40% charge in less time than a Model S P100D. In turn, this means that the Model 3 will spend less time at the rather high 115 kW charge rate, but it will be faster at charging from 0 – 40% than a Model S or X with 100 kWh battery. The full charge – as reported by the owner – will set him back a total of $18.98. Bear in mind that electricity rates vary geographically, much like gas prices. Last we checked, the average U.S. price for electricity was around 13 cents per kWh. January 2018 rates show Louisiana with the lowest price, around 9 cents per kWh, and Hawaii the highest, at over 30 cents. Hawaii is an exception, however, since the next most expensive state is Rhode Island, at just over 22 cents. It doesn’t come as a surprise that a Supercharger in what we’re guessing is California will rack up the charging bill this fast. While there are many other potential variables to decide the cost of electricity and the resulting supercharging cost, the price to fully charge this Tesla Model 3 Long Range seems a bit steep. We may be wrong, however, and would love to hear your personal experiences regarding charging a Tesla Model 3 on a Supercharger in the comment section below. 76 Comments on "Watch Time-Lapse Of Tesla Model 3 Supercharging From 0 – 100%"
Wow, that charging ramp really comes down after 75%, is that normal for a model 3? It’s common with all EVs, but you already knew that before you lamely tried to spin it into your negative Tesla narrative. Nobody believes you’ve ever driven a Model 3, much less been left alone with one for 250+ miles to need to fast charge to finish a trip, GM fanboi. Stop making excuses for your intentional spreading of bullpucky, and just stop doing it. Actually we went 200 miles over snoqualamie pass, we already had this-argument months ago, when you, and Pu-Pu told me is should use regen coming done the pass…. Wrong! ” drove from my house in Brighton (NE of Denver) to the top of Mount Evans today. It’s about 160 mi. round trip (incl. a few errands on the way) with an elevation change from ~5000 ft. to ~14,000 ft. I charged to 100% just prior to leaving just in case we decided on a detour. I used 57% of the battery to get up there (indicator showing 43%). I wish I would have thought to take a picture of the screen but the wh/mi was over 370. You really just don’t care at all how many people know that everything you post about Tesla and its cars is false, do you? Heck, I have a friend who says his 2001 Honda Insight charged up its battery pack to 100% when driving down the far side of the Colorado Rockies, not using any gas at all… and that car is only a HEV; a non-plug-in hybrid! Even the other serial Tesla bashing FUDsters must find you embarrassing, Mr. Troll. 1kWh all the way charged up with a 10kW motor coming down the Rockies? Color me unimpressed. Valid standpoints deserve impressive anecdotes. Mellow your harsh, no need to be rude. It is almost like you’ve never seen an EV fast charge. Yes, it is very normal for all EV’s for the charge to taper off. You’re being negative on many cars. i3 is not 25 kW at 75%, nor is eGolf. And I’ve seen Leaf at 25 kW at 60%, so you’re being too positive with that. SparkEV is 53kW at 75% despite have only 18.4kWh battery. I gave a rough range based upon the graphs provided by Fastned for all different battery sizes for each model. Go look at the graphs in the link I provided and go argue with Fastned if you disagree with their graphs. 25-50kW at 75% for i3 is not “rough range”. That’s slander. I looked at the graphs, they are not 25kW. And you’re being too generous with Ampera-e, too; it’s pretty much solid in 25kW, nowhere near 30 kW. You’re slandering Bolt to be better than it is! Reports says the Ioniq can charge to 77 kW, which is pretty good for a 30 kWh battery. Slightly above 2C up to 80%. I can’t seem tof ind these report, I probably misrememberd. It’s 175A max up to 390V. It probably depends on where you look. Billed or added to the battery. There ARE losses. CAM, I’m not sure where you got your data for the i3 22kWh, but I got mine from the link I posted to an earlier story here on insideev’s from fastned, and right from this story here. If you have some other source, post it. It is certainly possible that different sources have different data. In fact, the data is expected to vary from session to session and car to car. Which is why I used rounded ranges of numbers. The rest of your numbers are exactly within the range I stated, where I rounded the ranges to the nearest 5kW. I rounded, because the numbers on the graph should not be pedantically interpreted down to any more accuracy than that when they are applied to comparing lines of cars in abstract. That is because VARIATION BETWEEN INDIVIDUAL CARS, TEMPS, CHARGERS, ETC ARE EXPECTED TO VARY FROM THOSE CHARTS. Spark EV is aweome fast charging, Pisses me off that used Spark EV prices have gone up so much, used to see them for $6-8k and now hard to find any under $8k. Drove one in the desert heat, fast charging, sitting in a hot garage and that sucker lost almost no range over 3 years and a LOT of miles. but those are all much smaller batteries then the Model 3, I was under the impression the bigger the battery the more Kw it can take ant any given SOC.? Are you joking? Look at the numbers I provided, or go back to the source I provided. Except for one car on a charger only available in Europe, at 75% the Model 3 at 60 kW is charging 10 kW to 35 kW FASTER than cars with smaller batteries. And that is at 75%, which you seem to have cherry picked as a SOC to try to distract away from the bigger picture. At peak charging rate, the Model 3 charges at DOUBLE to TRIPLE the peak rate that all those car can currently charge in the United States. Maybe you are a troll and are too ignorant to understand I’ve already answered. Twice. With a source to prove it. Now go sod off, it is clear that your only goal on Tesla stories here and on other EV websites is to distract and change the subject away from any positive story about Tesla. Like this story showing how super fast the Model 3 charges such a large number of miles. Maybe Nix doesn’t understand that your strategy in posting a blizzard of FUD is to overwhelm any attempt to correct your many, many, many “talking points” of deliberate disinformation about Tesla and its cars. Also called the “Gish Gallop”; it’s a dishonest debate strategy. You don’t merely post misinformation, but intentional disinformation. That is, you know what you’re posting is false, and you do that as a deliberate strategy. Trying to correct all your B.S. is like a game of Wac-a-Mole. The way to win… is not to play your game, but to point out that you keep trying to cheat. You and Nix need to stop fighting so much. The Tesla Supercharger has an upper limit to what it can output. 135kW, 150 kW, depends… A Tesla also has an upper limit. Here’s an example: An original 60 and an original 85 draw different power levels. I know this because I own two Tesla Model S vehicles. The S 85 draws closer to the max power than the S 60. You are correct. Does this apply to the Model III? Dunno. Don’t forget about that upper limit for the Supercharger, though. Also, never forget to do your heat equation! The loudest a Tesla gets is when it is standing still. Charging. Model 3 max draw is shown in the video and listed in the story at 117 kW. The Model 3 tapering is the most aggresive tapering of all these cars, it starts already at 40%. True, but it also peaks much higher. The Model 3 LR is great for quick travel if you charge to 70 or 80% while on trips, and 70 or 80% is like 200+ mile range. This is a good distance between stops. An efficient car with a large battery, the tapering is probably the compromise they had to make. This is why you get the long range version to drive long ranges (who would have thought based on model name). On trips you just charge to 80% and drain to around 20%. The base model is going to be much slower due to slower charge rate and need to charge above 80%. I assume you noticed the section where it was charging at a rate of over 400 miles range / hour? Yes, the ramp down becomes quite dramatic. This is why some report charging to 80%, accepting the shorter range, to return to the highway sooner. It is common with all BEV vehicles. I agree, Bob. I think most BEV drivers come in to a charger with around 5-20% left in the pack and only charge up to 75-85%, and then hit the road before the taper really kicks in for long. It all comes down to the location of the chargers, the nature of the route and the distance you need to cover. Charging from around 10% to 75% can be done really quickly and gives you more than 2 hours of additional highway AER if you have a pack that is at least 70 kWh and a reasonably efficient BEV and you settle for speeds under 80 mph. But this does show why a 75 kWh pack is probably the smallest most drivers would want to own if they road trip very often. Larger packs will give larger sweet spots where the car is charging at its fastest rate, before the near inevitable (for now) taper kicks in. 1) This only matters when you are taking a long trip. 2) Programming your route takes all of this into account so you optimize typically stopping for 30-50 minutes per stop. 3) If you are traveling over 500 miles and time matters, consider flying. I gladly trade the weekly vampire time drain of navigating the fueling station, checking for card readers, entering a zip code, and no I don’t want a slurpy with that. The same argument can be said about Leaf and it’s rapid charging. That depends how long the trip is. It was not the first time you fast charge that was the problem. 0-80% in 43 minutes in really good. Looking at these numbers, 0-80% in 15 minutes is unbelievable. Almost a game changer. Take a look at the Ionic. There was an article here with a video of one charging 10 to 80 in under 20 min. 10% to 80% is just 35 minutes! Wow! This really shows why every car maker talks about their charge time to 80% charge, because from 10% to 80% is super fast. The last 20%, and the first 10% adds up to well over an hour! Moral of this video is once your Tesla is at 80%, step away from the supercharger, and head for the next supercharger. Actually, the low initial speeding on the model 3 is Tesla specific. Other EVs will accept the highest current in the beginning with voltage lagging behind. Personally, I would not go below 10% SOC. 80% is the magic number in most BEV except for the Bolt, which tapers way too soon. Sorry, my post wasn’t clear enough. The 80% number is what is common for all car makers. The 10%-80% comment applies only to the Tesla. With how fast the supercharger network is expanding, there shouldn’t be much need to go below 10% charge, with the rare exception proving the rule. With Tesla taper, 80% is much. If one can live with shorter time at supercharger, leave after about 50% when taper begin to kick in. That will free up the supercharger for other people who have low SoC. Exactly, quick chargers in general should stop when the charge rate drops too much and have L2 chargers people can top off at if they want. Or maybe have the cost increase after 30 minutes to move people out. I hope Bolt owners take your advice and leave at 55% SOC. I see too many plug-in at 80% SOC. Ioniq do up to 80% in 20 minutes. If it can manage that with a 65-100 kWh battery it will be a game changer. It will be very interesting to see what happens to the charging when they go bigger. It will be interesting what the Supercharger V3 chargers will do for charge speeds. They are supposed to be 200 to 250 kW, and may come as soon as some time this year. I doubt they’ll do anything to improve the best case (not sharing power). It’s the car that sets the limit. The graph in this story shows it maxing out at 117 kW at one of the older 120 kW max chargers. We do not know if it is charger or car limited. Yes, it may require an OTA update for the new V3 superxhargers. Full stupid to charge until 100%, as the last few percent cos more than 15$ and last so long. 90% is like 3-4$ for 450km (300mi). And this is cheap! I think you might be missing the cost is based on the energy being put into the batteries. The duration of being there does not matter. Depends on market. Due to regulations, Tesla has to charge on time instead of energy in some states. Some other networks even charge on time everywhere. What states does Tesla charge by time at a Supercharger? 65% in only 31 minutes. And 75% in 39′. That’s impressive. So it’s 300 kms in 30 minutes and 350 in 40. A coffee and a pee and you’re ready for 300 kms more. EDIT: AND! $19 a full charge. Which would mean 20~22 euros in Europe. 22 euros for 450~460 kms range -vs- 38.5~40 euros in Diesel. That means ~7800 euros saved (if always charged on SUCs, which is the worst possible scenario) after 200.000 kms. Both gasoline/diesel and electricity is far more expensive in most places of Europe compared to the US. I took that in account. In fact I’ve made the calculations having 27-29cts/kWh in mind and 1.35-1.40euros/L for diesel (which is the standard here in Spain). But I’m afraid that SUC charging will be a bit more expensive. Like 35cts. Maybe it’s a slightly different chemistry in the batteries? Or they have improved the charging. Cooling and power electronics have supposedly improved, too. Now for the standard M3 I’m willing to bet we don’t see much over your calculated 1.55c, but I hope I’m wrong and they have extensive testing and come close to 2c without harming the battery in the long term! That would be quite a nice incremental step forward, and would lend to you/I/Model 3 LR being able to charge even quicker in those opening 20%, but more than likely mostly for a new battery chemistry (incremental upgrade? Major overhaul?) not yet in use. The 1.2C maximum for 100 kWh S/X packs is not specified explicitly anywhere, but derived from the fact that they max out at 120 kW. I doubt they are taking any higher risk. Rather, they have determined the new cells to be fine with the higher rate. Percentage discussions are OK, but what really matters to me is “miles per minute”. And what I see here is in about 20 minutes, I can get 130 miles of range in my Model 3, which should easily be enough to reach the next Supercharger. So essentially, drive for a couple hours, take a 20 minute break, repeat, no more gas. That’s exactly how to do it. Get in a little walk and/or snack. Just give a little more buffer in case you are re-routed and have to backtrack 5-15 miles because of a closed offramp. Happens in rural areas more (I’m assuming) due to the offramps being so far apart compared to more urban places. 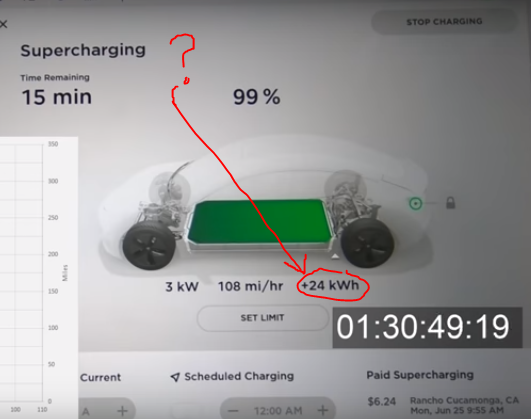 At the 33 minute mark, there was a “brief interruption to charging” and I noticed the Paid Supercharging went from $12.74 to $0. How much can you rack up in charging costs before Tesla makes you pay? How do you pay or does it automatically bill your card? I ask because I have something like $4 on my account, but I don’t know of any links to pay this off. What is this number tracking? I thought it was cumulative charge this session but it’s not the full amount at the end and resets some number of times throughout. That’s the energy added. It only resets once, at the 33 minute mark (50kWh). So 50 +25 = 75kWh total. Kdawg answered it very clearly.